Having a steady stream of fish stocked in my freezer for the past few weeks has been great. Usually we don’t have fish as often as I would like, mostly because there is no space left in the freezer after I have filled it with meat. Now I have the opposite situation and I must say I am thoroughly enjoying eating more fish and trying out some new tasty recipes. The best thing about fish is that it takes barely any time to cook! This recipe is really easy and great for anyone who likes Thai food. Not only that but it’s exceptionally quick to make and low in points. Feel free to use any white fish you like. I used Red Mullet as it has the most delicious flavour and a lovely texture. Preheat the oven to 180c. Pop the rice on to cook, steam the broccoli/green beans over the top using a colander. Pop the red mullet on a baking tray, skin side up and then cut three or four deepish slashes across the fish. Spread 2 tbsp of the curry paste over the skin using the back of a teaspoon to make sure it is well covered. Put under a hot grill for a few minutes until the skin crispens up a little. Then transfer to the oven for around 10-12 minutes until the fish is cooked. 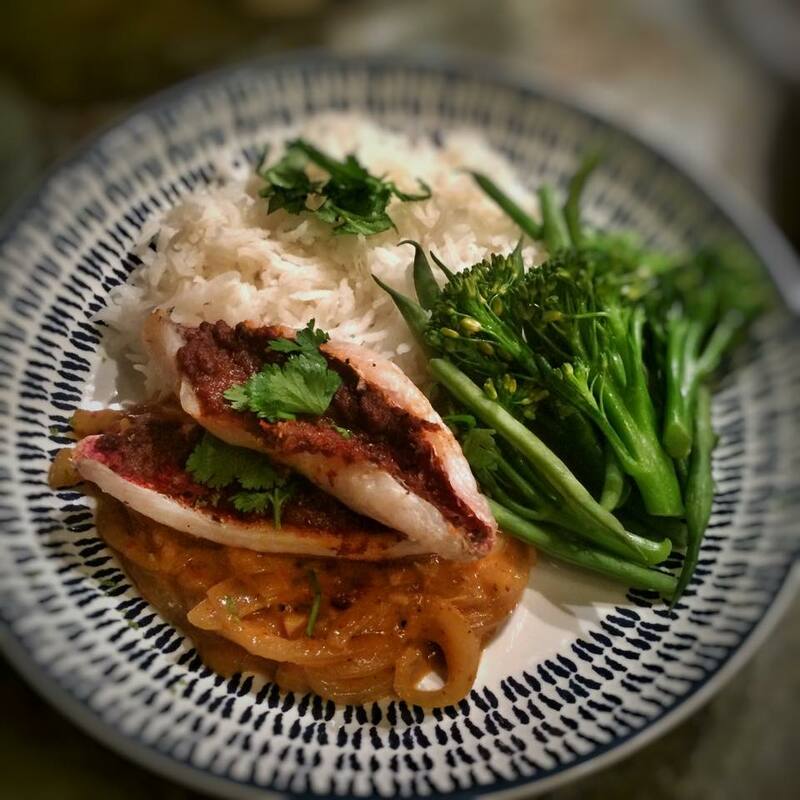 Whilst the fish is cooking, in a sauce pan add the coconut milk, the rest of the curry paste, fish saue, sugar, crushed chillies and the juice of ½ a lime. Simmer until the sauce thickens a little. Serve the rice with the red mullet on top. Pour over the sauce and top with the green beans/broccoli, a ¼ of lime per person and a sprinkling of fresh coriander. This recipe was great. Tried it with Doversole -it worked well. Thanks. Just had ur email for chicken pathia so will try that curry next. My partner is enjoying these recipes too.